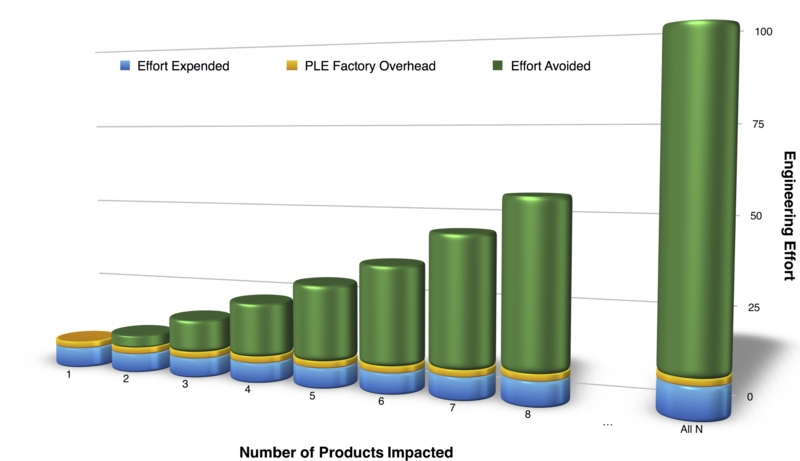 The Economics of Product Line Engineering | BigLever Software, Inc. Taking efficiency to a whole new level. Engineering Effort with Product-Centric Approaches. As an organization carries out its daily engineering work, that work can be characterized by how many products in the organization’s portfolio each piece of work affects. Capturing a new requirement, repairing a software source code defect, writing a more comprehensive test case, adding a new piece of hardware to the bill-of-materials, altering a design model — each of these tasks, and other tasks, can be characterized by how many products in the product line it affects. Suppose a task affects four products. In a product-centric environment, each individual product team will apply that task. The engineering effort required is illustrated by the blue cylinders. Suppose each team accomplishes the task as efficiently as possible, even setting efficiency records — and the organization’s leadership is very pleased with the each team’s performance. It becomes immediately and painfully obvious that the same work is being carried out four times. Product teams can be as efficient as they like — but a portfolio perspective reveals that product-centric thinking results in an organization that is jarringly inefficient. Under the Feature-based PLE approach, when the organization undertakes a task affecting four products, the task is carried out once — inside the PLE Factory. Learn more about the PLE Factory. Effort Avoidance with Feature-based PLE. Under the Feature-based PLE Factory approach, the task affecting four products will involve changing or adding to the shared asset supersets, or the Feature Catalog, or the Bills-of-Features for the products. Then, the PLE Factory’s automated configurator is used to apply the work to each product that needs it. No matter how many products benefit from the task, the task is only done once, consuming one “unit” of effort. The gold disk in each cylinder measures the overhead of the PLE Factory approach — which includes creating asset supersets equipped with feature-based variation points, and constructing the Feature Catalog and Bills-of-Features. The green segment of each cylinder measures the engineering effort avoided through the PLE Factory’s automation. With the PLE Factory, engineers carrying out the task have done the work of a team four times their size under the old approach. They can claim with absolute justification that they are four times as productive as their pre-PLE-factory counterparts. Savings from the effort avoided manifests in different ways throughout the organization. Engineering leadership will enjoy higher productivity, lower overhead, less work, higher quality, lower defect density, faster time-to-market for new features and new products, and greater scalability of the product line. To business leadership, those very same advantages translate to bigger margins and higher profit, more competitive pricing, more proposal wins, higher sales, beating competitors to market with new innovations, better product reviews, fewer recalls, happier customers, and a more diverse product line to penetrate broader market opportunities.